Murano Glass Lamps and Chandeliers in Amethyst color are very appreciated thanks to their gentle violet color. A glass work of art like our Murano Chandeliers will stand out in any room and will give the appearance of a precious object made entirely from Amethyst, a gemstone which has been loved and cherished since antiquity. 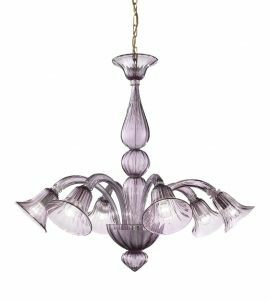 Violet is one of the trendiest colors today so why not go ahead and purchase a Venetian Glass Chandelier which will complement the other decorations in your home?